The ship dropped anchor in the Gulf of Poets and we clamored into the tender to go ashore. Packed together with other passengers, I recognized the usual early morning "flavors" - tanning oil, perfume, deodorant, after shave--all doomed to fade quickly away in the muggy heat. 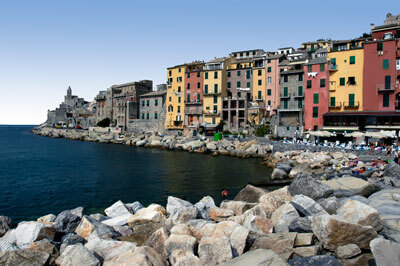 Portovenere, which was a pleasant surprise on our 2001 cruise, remains one of our favorite sea towns. It always seems tranquil, no matter how many visitors arrive by cruise ship or auto. Whether viewing the town from the ship or a quai in the harbor, it is always a wonderful sight. Its pastel buildings hug the steep hills, while the church and citadel tower above. We stopped for morning coffee and sent post cards to three friends in Surrey, England, whom we met in 2001 and who also love Portovenere. Then we began our walk along the harbor where we found an outdoor movie theater. The Grotto Byron was packed with swimmers, divers and sun bathers. Two years ago, heavy waves crashed into the rocks and the place was filthy with debris. Today the water was calm and the grotto remarkably clean. Keeping a watchful eye on the scene was Mother Nature, as sculpted by Lello Scorzelli. Further up the hill is the Church of St. Lorenzo, whose tower is visible from the harbor. The original Romanesque church of 1116 burned in 1340, was rebuilt in Gothic style (bell tower added), severely damaged by the Aragonese in 1494, restored again in Baroque style, and finally restored in 1934 to something approximating its original style. Above the entrance is a carving of the martyrdom of St. Lorenzo. The interior is quite beautiful, with wooden ceilings, a remarkable font, four ivory casks from about 1100, and some 17th century satin hangings. In the courtyard, I watched two boys and a goat. The boys had rigged up a basketball net, using a fish net on a pole, and were shooting hoops with a small soccer ball. In addition to playing basketball instead of soccer, they also spoke French rather than Italian. And swore in both French and English. Watching them from above, was a goat whose bleating and swollen profile indicated she needed milking. This was a scene I hadn't expected. Portovenere is at southern end of the Cinque Terre, or Five Lands. Actually, it is five villages on a rugged coastline, somewhat isolated due to poor access roads, but all linked by a popular hiking path. Three days a week, excursion boats leave from Portovenere to all five villages. We took the 3 PM boat. It takes about two hours for a round trip. This is a wonderful excursion, especially on a calm sea under sunny skies. Each of the villages is unique. Riomaggiore sits against black rock cliffs; Manarola is surrounded by terraced vineyards; Corniglia is reached by climbing 377 steps; Vernazza's tall houses are especially colorful; and Monterosso is a beach and cultural resort. Our boat was packed and we were seated in the open air amidst a crowd. By the time we reached Monterosso, most of the others had disembarked and we could get a good viewing seat at the bow for the trip back. Unfortunately, the return trip turned out to be an express, bypassing Manarola and Riomaggiore. Also, we were heading into the wind, which caused some salty sprays onto the bow. Still, the trip was worth it. If you start early enough and buy a full day ticket, you can get off in any of the towns, explore a while, and get back on the next boat. That would be a wonderful way to really see all five villages. We ate at La Miramar, whose specialty is seafood, but it wasn't anything special. Portovenere is especially nice after dark. There is little ambient light to obscure the stars on a clear night. The houses are lit up, the restaurants are filled with diners, and the lights sparkle on the harbor. Ever since our return trip from the Cinque Terre, the sea had been getting choppy, even here in a protected harbor, causing boats to bounce a bit, their lines snapping on the masts. Wonderful sounds for those who love the sea. During the night, I could feel the sea beneath the ship and I hoped that we would finally experience some serious sailing weather. But I also wondered if it might keep us from our next port, Portofino, as happened two years ago.